There are countless recipes and creative ways to eat the foods that maximize our health. In many cases, people that have transitioned from the Standard American Diet to a whole-food, plant-based lifestyle were initially unaware of just how tasty nutritious foods can be. The following recipes are courtesy of STLVegGirl, Caryn Dugan. Find more of her delicious recipes here. 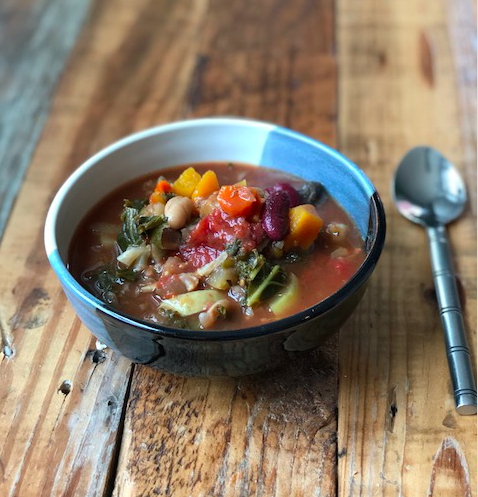 From greens to cruciferous to beans and roots, this is the tastiest, most nutrient dense and low-cal veg soup you'll need to stay healthy, satisfied and fit any time of the year. Lentils, beans and quinoa make up the protein trifecta of this power bowl. Depending on whether you divide it into two or four servings, this hearty meal dishes up 11-21 grams of protein per bowl. Tossed in a creamy cashew bath, these roasted Brussels really shine when paired with smoky coconut bacon and salty olives. Wait! Don't throw that out! Let's cut down on waste by using the entire food and infuse even more nutrition into our meals. Did you know that carrot greens contain 6 times the vitamin C of the root and are a great source of potassium and calcium?! Your garden is sprouting with more green beans than you can handle! Quick cook those suckers, toss in a little dill and some cool cukes and WOW!